This warrior looks pleased to be in DC. You don't have to go to Xi'an in China to see the Terra Cotta Warriors. They're right here in DC. 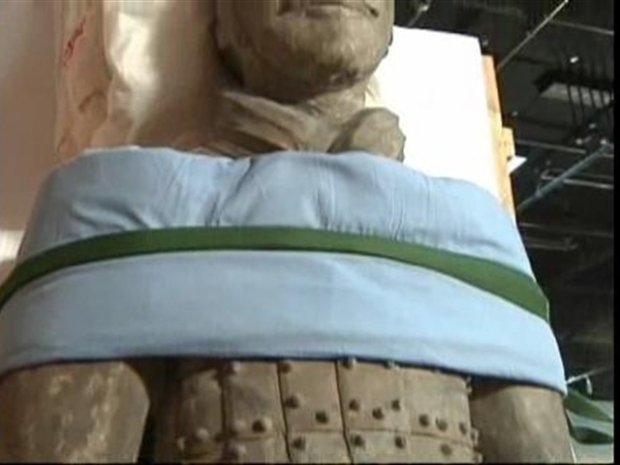 The terra cotta figures, which are over 2,000 years old, once guarded the tomb of Chinese emperor, Qín Shǐhuáng Líng. They were accidentally discovered in 1974 in Xi'an, Shanxi province, by some local farmers. In China, there are three pits containing over 2,000 soldiers and 100 chariots with 400 horses and 300 cavalry horses -- all made from terra cotta and all life-size, varying in height from nearly 6 feet tall to 6 feet 5 inches. The National Geographic Museum will have 15 of them on display from Nov. 19 through March 31. This is the first time the museum has had a ticketed exhibition; according to museum officials, more than 70,000 advance tickets have been sold so far. In Houston, the warriors' previous stop on a four-city U.S. tour, the Museum of Natural Science was open 24 hours on the final weekend of the Terra Cotta Warriors exhibit. And when the statues were in London in 2007 and 2008, the British Museum was forced to turn people away -- even though the museum kept its doors open until midnight four days a week, the Washington Post reported. Tickets to see the warriors and nearly 100 other objects from the emperor's tomb are $12 for adults and $6 for children ages 2 to 12. The museum says it plans on keeping its regular hours for now.